PYONGYANG, North Korea (AP) — Dennis Rodman, the former NBA bad boy who has palled around with North Korean leader Kim Jong Un, flew to Pyongyang on Tuesday on a trip he says he hopes will "open a door" for his former "Celebrity Apprentice" boss — U.S. President Donald Trump. Hours after his arrival, U.S. Secretary of State Rex Tillerson announced that North Korea had released an American student serving a 15-year prison term with hard labor for alleged anti-state acts. It wasn't immediately clear whether the release was connected to Rodman's visit. Rodman, one of the few people to know both of the nuclear-armed leaders, sported a black T-shirt advertising a cybercurrency used to buy and sell marijuana as he talked to reporters briefly before boarding his flight from Beijing to the North Korean capital. 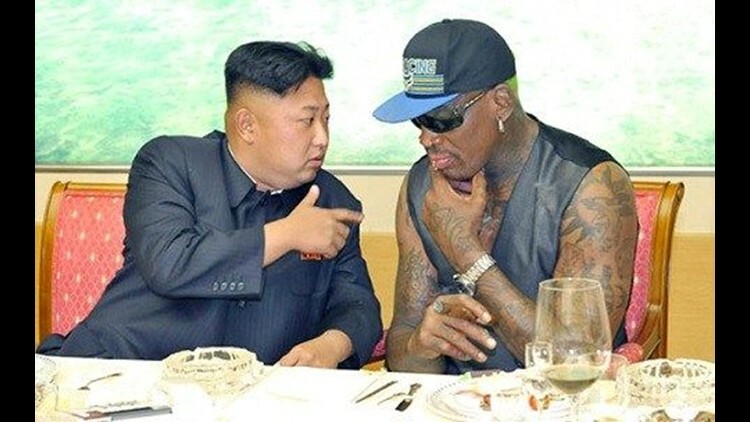 Rodman's arrival in Pyongyang was relatively low-key and his schedule remained a mystery. He was met by North Korean Vice Minister of Sports Son Kwang Ho. Officials said he was to stay until Saturday. He breezed through customs and immigration at Pyongyang's airport before being whisked away to his hotel. "I'm just here to see some friends and have a good time," he said. Rodman received the red-carpet treatment on his four past trips since 2013, which generated a lot of publicity — most of it not good — and did little in terms of diplomacy. On this trip, he has already been roundly criticized by some for visiting during a time of high tensions between the U.S. and North Korea over its weapons programs and recent missile launches. "Well, I'm pretty sure he's pretty much happy with the fact that I'm over here trying to accomplish something that we both need," Rodman said in Beijing when asked if Trump was aware of the trip. Rodman said the issue of several Americans currently detained by North Korea is "not my purpose right now," suggesting he was not involved with the release Tuesday of Otto Warmbier, a University of Virginia student from suburban Cincinnati who publicly confessed to trying to steal a North Korean propaganda banner. A North Korean foreign ministry official confirmed that Warmbier was released and left the country Tuesday morning. Secretary of State Tillerson said the State Department is continuing to discuss three other detained Americans with North Korea. In Tokyo, a visiting senior U.S. official said Rodman is making the trip as a private citizen. Any visit to North Korea by a high-profile American is a political minefield. Rodman has been criticized for failing to use his influence on leaders who are otherwise isolated diplomatically from the rest of the world. He has generally brushed off such criticism as unfair because as an athlete and celebrity he shouldn't be expected to solve difficult political problems. A statement issued in New York by a Rodman publicist said the former NBA player is in the rare position of being friends with the leaders of both North Korea and the United States. Rodman was a cast member on two seasons of Trump's TV reality show "Celebrity Apprentice." There is an internet urban legend that North Korea is a pothead paradise and maybe even the next Amsterdam of pot tourism. But the claim that marijuana is legal in North Korea is not true — it's considered a controlled substance in the same category as cocaine and heroin. Americans have been sentenced to years in North Korean prisons for seemingly minor offenses and likely could not expect leniency if the country's drug laws were violated. Associated Press journalists Mark Schiefelbein in Beijing, Mari Yamaguchi in Tokyo and Matthew Lee in Washington contributed to this report.